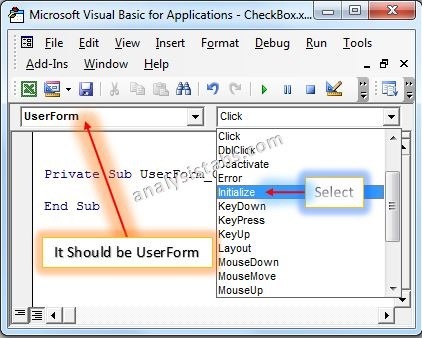 Please find more details about VBA ActiveX Combo Box Control and how we are adding it on the UserForm. Drag a ComboBox on the Userform from the Toolbox. Please find the screenshot for the same. Now, add the following code to the in between procedure. Please find the following steps and example code, it will show you how to add dynamic Combo Box control on the userform. Add command button on the userform from the toolbox. Now, it shows following code. Call the below procedure named ‘Add_Dynamic_ComboBox ’ and find the below procedure to run. Now, click F5 to run the macro, click ‘Create_ComboBox ’ button to see the result. You can see the created dynamic combo box in the following screen shot. Please find the following code, it will show you how to add list items to Combo Box. In the above code ComboBox1 is the name of the Combo Box. Where ‘additem’ is the property of Combo Box. Please find the following code, it will show you how to clear the Combo Box items. The below code clears the ComboBox1 items on the UserForm1. Please find the below code to know how to get the selected value of the Combo Box using VBA. In the below example value is the property of Combo box. Here is the VBA Combo Box default values in Excel. After adding items to Combo Box by using any of the below code you can define the default value. The below code is useful to select blank option in Combo Box . Where ‘-1’ is the index number. The below code is useful to select first item in the Combo Box from the available list. . Where ‘0’ is the index number. The below code is useful to select second item in the Combo Box from the available list. Where ‘1’ is the index number. The below code is useful to select the last item in the Combo Box from the available list. Where ‘1’ is the index number. Here is the following example, it will show you how to get the total count of items in a Combo Box. In the below example ComboBox1 is the Combo Box name and ListCount is the property of Combo Box . Please find more details about Remove Duplicates in Combo Box in Excel VBA. 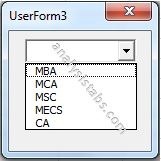 Please find the following link for more details about VBA Combo Box Excel Macros Examples and Codes Adding and Clearing Items.